Elizabeth Nourse was a Cincinnati native from Mt. Healthy, and a graduate of the McMicken School of Design, now known as the Art Academy of Cincinnati. After completing her education, Nourse was offered a teaching position at the art school, but did not accept because she had bigger plans for her future as an artist. She moved to Paris with her sister to establish her career as a professional painter. Her self-portrait was painted in 1892 and shows the artist looking directly at the viewer. This type of gesture was more commonly used to depict male subjects at the time because it evokes strength and dominance, two characteristics rarely attributed to women. 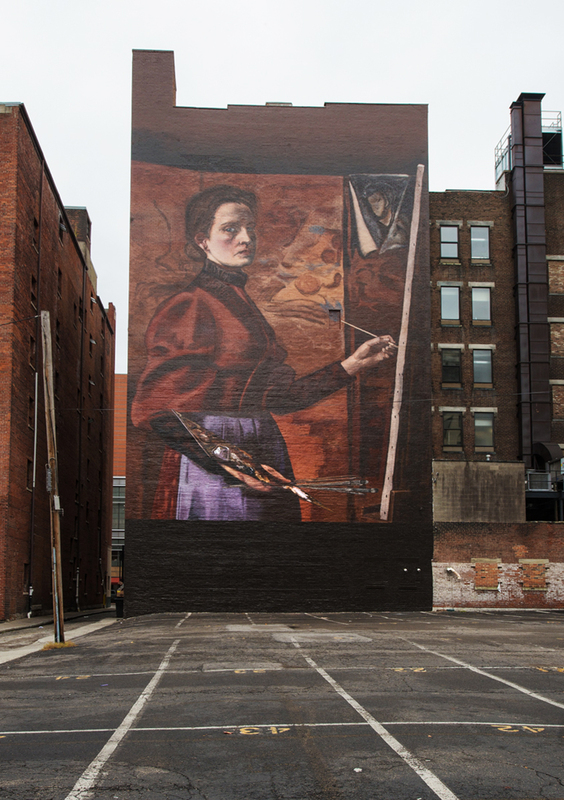 Through this mural we celebrate the life and accomplished career of Elizabeth Nourse, a masterful figure in the history of art. Special thanks to ABM Parking Services and Towne Properties.